Genetic modification is not a new technology. But a new tool, CRISPR, now elevates it to a much higher level. And op top of that, genetic modification is in the course of a rapid automation. This allows us to change microorganisms much quicker and cheaper than just a few years ago. Says Jack Pronk, professor at Delft Technical University. 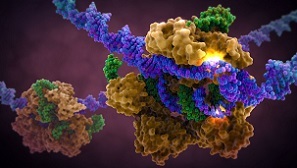 Enhanced picture of the CRISPR mechanism. Mankind has applied biotechnology for centuries, although for a long time we did not know that microorganisms are involved in the production of beer, wine and cheese. It was not until the discovery of DNA that science could start looking purposely at the way in which genes supply the codes for enzyme production. From the seventies onwards researchers could modify genes in order to enhance the production of those enzymes. At first this was a tiresome job, and it required a lot of funding; after a while, we mastered better the art of introducing new properties into organisms. But in the past few years, the development of genetic modification has made a take-off. The key concepts are CRISPR and automation. Many technologies develop at a speed that we can hardly grasp. Society invariably feels that technology develops much faster than it can manage. Synthetic biology is no exception to that rule. Genetic modification has been with us for forty years, but the speed and ease of genetic code modification by synthetic biology nowadays, even the synthesis of entirely new compounds, is really stunning. This was the subject of a meeting in The Hague recently, organised jointly by RIVM (the official body that oversees food and environmental safety) and the Rathenau Institute (the parliament’s watchdog for long-term technological developments). The keynote speech was held by Jack Pronk, professor in industrial microbiology at Delft Technical University. One of his focal points was CRISPR (Clustered Regularly Interspaced Short Palindromic Repeats, for lovers of acronyms). He called the technology a ‘Swiss knife’ for microbiologists, it offers all the tools they could wish for; others referred to synthetic biology as ‘a radical departure from existing knowledge’. The outside world now also gets a feel of the importance of the speed of developments in this field, recently The Economist published an article that discussed at length the blessings and corresponding threats of the new technology. 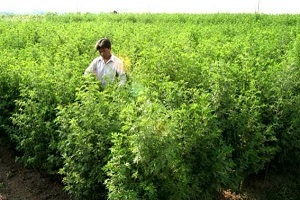 Artemisinin, a powerful antimalarial drug, was originally extracted from Artemisia Annua but can now be produced at an industrial scale from a modified yeast. But before we got there, mankind had a long way to go. For ages, growers bred new plant (and animal) varieties by crossbreeding existing varieties and continued to breed with the best results. After that, researchers changed genes in bacteria, yeasts or moulds using UV light or chemical agents. This was a cumbersome way to breed new useful varieties, because genetic changes were produced at random. The existence of useful changes had to be established in an intensive selection process, and improvement was only incremental. And yet, this procedure led to the improvement of penicillin production for instance, a painstaking process within companies like DSM that took over fifty years. ‘Metabolic engineering’ could only take off when researchers could copy and paste DNA purposely, increasing their knowledge of the genomes of microorganisms at the same time. But even that proved to be a lengthy procedure; as a rule changes were introduced one by one. Moreover, during their experiments researchers often learned that the microorganisms were just slightly different from what they had had in mind. Nevertheless, along these lines success stories of industrial biotechnology were developed like DuPont’s Sorona (1,3-propanediol) and modified bakers’ yeasts that process corn stover to alcohol, developed by DSM and Delft TU. From 2010 onwards, synthetic biology contributed many additions to the toolbox of genetic modification. In 2010, researchers succeeded in assembling dozens of different DNA molecules in a controlled way. Their tool was homologous recombination, a process that occurs naturally in living cells that have suffered DNA damage. And now there is CRISPR, the ‘Swiss knife’ as Jack Pronk called it, that can be applied in a great variety of living organisms, from bakers’ yeast to human cells. Originally, CRISPR is a kind of immune system that protects bacteria from viruses. It consists of a protein (Cas9) that is directed with great precision by a little RNA fragment to a location in the DNA, where it cuts the DNA in half. Researchers can produce several modifications in just a single experiment, by introducing Cas9 into a cell together with several RNA fragments. Jack Pronk highlighted that researchers in his lab used CRISPR to switch off and replace six genes in bakers’ yeast in one single experiment. It took just a week, instead of several months as it did in the past. Automation is another revolutionary development in the world of genetic modification. Robots can produce and test thousands of genetically modified microorganisms simultaneously. This will result in a much shorter time-to-market for new antibiotics, fuels and bioplastics – possibly just five years instead of ten. These developments combined have led to an explosion of activity in pharmaceuticals production (in the US, Amyris produces thousands of new bakers’ yeast strains per week, which has led to the industrial production of the powerful antimalarial drug artemisinin already), in agriculture (Monsanto is very active) and in industrial biotechnology. But, as The Economist notes, there are rather dubious applications as well. Some labs (in China and the UK) experiment with the repair of genetic defects in human embryos. Among scientists, this has led to a call for a moratorium on such research. But in areas like medicines development and industrial biotechnology, activities skyrocket.